Bringing Family Dinnertime Back PLR Bundle $47.00 Eating dinner together with your family is a great way to make amazing memories, eat better, and improve relationships. If you want to teach your audience about how simple, beneficial, and fun this can be you’ll want to get this done for you package that you can use as is or make your own by adding pictures, beefing up the recipes with brand names, and more. Getting Organized PLR Articles $12.97 Each Getting Organized Article is well-written, has at least 450 words, and can be used as either blog posts, email autoresponder articles, or put together into an eBook. The potential for these articles is only limited by your imagination. Add examples, pictures, and your own touch and your audience will thank you. Weight Loss PLR Articles $12.97 If you serve the weight loss community and need general articles that cover the gamut this package will make you very happy. Each article is at least 450 words, they are well written and don’t rely on just fads to get the weight loss information to your audience. Green Living PLR Articles $12.97 Today, sustainability and renewable energy are all the rage. If you have a blog, website, or promote products that fit into the green living category, this pack will do wonders for you. Each article is at least 450 words, well written, and accurate according to science. Use one of these articles to organize a challenge, host a webinar, and promote sustainable living. Don’t miss out. You can use this package anyway you want to. Budgeting Basics PLR Articles $12.97 This package of 10 Articles helps take the fear and mystery out of creating a family budget that doesn’t involve suffering. If you want to create a family budget or teach your tribe all about budgeting the easy way, Budgeting Basics is the article set for you. Thanksgiving PLR Content Bundle $7.00 Use this Thanksgiving Themed printable for a variety of purposes. Sell as is to your audience. Print out and use for yourself as place cards for your dinner guests, add to thank you notes, use in your classroom, clip them and use in your online memes and in posts. It’s totally up to you. Plus we've included 25 images and 10 quotes for your Thanksgiving content planning. Healthy Living PLR Articles $12.97 Want to teach your audience to live heathier? These healthy living articles will inspire you and delight you. Each are at least 450 words long, well written, can be backed up by research, and you can use them however you want. 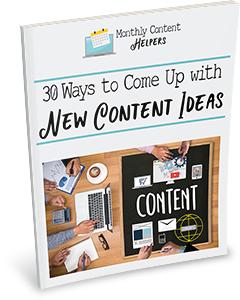 Turn them into autoresponder emails, create a course, or combine to create a book. It’s up to you. Healthy Habits PLR Bundle $47.00 It can be hard to be healthy when you’re so busy, but this package can teach you and your audience how to create habits that last a lifetime. Just like you can create a bad habit you can create a good habit, and this package will help you get yourself, your spouse and your kids on the right path. Life Planning for Your Teenager PLR Bundle $47.00 This pack helps parents understand how to teach their children to plan their life. There are so many aspects of adulting that isn’t being taught to the newest generation that is being overlooked. Financial fitness, staying healthy, and even how to do laundry is a mystery to so many young adults that we thought this package was needed.